Choosing dairy free milk alternatives is a personal choice that is often based on taste preferences, health, allergies, and/or environmental reasons. Supermarkets today are full of milk alternatives, so it can be difficult to know which to choose. Here is an overview of the most popular dairy free milk alternatives and the differences in taste and nutritional value they provide. Almond milk is one the most popular dairy free milk alternatives, preferred by many for its mild, nutty flavor and subtle sweetness. It is made from soaking almonds in water for 6-8 hours, grinding finely, mixing with purified water (or coconut water), and straining to remove skins and particles. Almond milk naturally contains vitamins and minerals including copper, zinc, iron, magnesium, manganese, calcium, phosphorus, potassium, and selenium. Typically, most store-bought brands are fortified with calcium, Vitamins A, E, B, B12, and D, and also contain “lecithin” which is used as a thickener to help create a traditional milk-like consistency. Also note, some brands of almond milk (and other store-bought dairy alternatives) still use another thickening agent called “carrageenan.” Particularly for those who avoid dairy due to lactose intolerance, carrageenan has been linked with gastrointestinal problems, so consuming a product with this ingredient may be counterproductive. Cashew is the newest nut milk and has started giving almond milk a run for its money. As a nut milk, it does have a slightly nutty flavor and a very creamy consistency and smoothness. Cashew milk is made by soaking cashews for 2-4 hours and then blending the cashews and water together. For those who make their dairy alternatives at home, this nut milk has the advantage of needing minimal to no straining. Homemade cashew milk is a great source of zinc, iron, phosphorus, magnesium, manganese and copper. Much like almond milk, store bought versions of cashew milk tend to be fortified with calcium and vitamins. 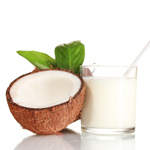 Coconut milk is another of the dairy free alternatives made by blending white coconut meat with water then straining to remove particles. This is not to be confused with coconut water, which is the liquid found in a coconut when cracked open. A natural coconut milk will retain some of that coconut sweetness but will have a slightly watery texture, while the store-bought version will be creamier and less coconutty. Traditionally, coconuts are valued for their nutritional and medicinal benefits since they are naturally rich in manganese, copper, selenium, and lauric acid. Most store-bought brands contain added thickeners and are fortified with vitamins and minerals. Rice milk is one of the lowest risk dairy-free milk alternatives for those with allergies to dairy or nuts. Natural rice milk tends to be creamy and earthy in flavor. Store-bought tends to have a thinner consistency and lacks that earthy flavor. It is made from blending cooked rice with water and typically some form of sweetener. As with most foods, making your own is a better option since store-bought versions often contain high amounts of sugar and thickeners/fillers. Rice milk does not naturally contain as many vitamins and minerals as some of the other dairy free milk alternatives like almond or coconut, but does provide nutrients like B vitamins and magnesium. Also, because it’s high in carbohydrates, it’s a good source of energy. Soy milk was the first popular dairy alternative, and has also become one of the more controversial. Studies have shown over-consumption of soy may be harmful – especially for individuals with hormonal imbalances or irregularities. Soy is also one of the more common food allergies. Soy milk is made by soaking dry soy beans in water overnight, blending, and straining out particles. A homemade soy milk will most likely have a bit of beany flavor and may tend to be on the watery side, while store-bought tends to be creamier and less beany. Soy milk generally has the highest protein of all the milk alternatives and is a good source of potassium. Flavorings such as ginger or vanilla may be added to improve the taste. When you are purchasing soy milk, look for organic, non-GMO brands since soy is one of the top genetically modified foods, and read the ingredients list to watch for added thickeners and other fillers that are added to lengthen shelf life. Hemp milk has become a more popular dairy free milk alternative in recent years, but is still something of an acquired taste. Natural hemp milk has a very strong earthy flavor and can have a bit of a chalky consistency, while store bought is less chalky and earthy tasting. Hemp milk is made similarly to almond milk by grinding up the hemp seeds and mixing with water. It does not contain the THC found in related varieties of the Cannabis plant, but it does contain a 3-1 ratio of omega-6 and omega-3 essential fatty acids. Hemp milk also contains ten essential amino acids, making it a good source of protein. Due to its unique flavor, it often contains added sugar. Each non dairy milk source comes with both positives and negatives. Knowing why you are choosing to make the switch to dairy free milk alternatives plays an important role in choosing which is the best for you. Generally speaking, you’ll receive more nutritional value by preparing these alternatives at home, but not all people have the time or resources to do so. Therefore, when shopping for your milk of choice, always remember to check the ingredients list first as you evaluate your purchase; if it contains a list of ingredients including several additives, consider an alternate option or, better yet, making your own.